With a library and 3 secret doors this house has a charm and tranquil relaxing feel to it from the moment you walk in the door. There are 2 large spacious Drawing Rooms opening onto a 50ft Veranda overlooking the garden. There is a beautiful Grand Piano in one Drawing Room and working open fires in all the rooms, plenty of wood in the log store. The house is also centrally heated with radiators. There is a large sunny well equipped kitchen next to character dining room. There is also a cosy Library Bar with secret doors and a great Pool table room off the Bar. There are four & a half acres of landscaped gardens with woodland & mature trees with a sunny lawn for outdoor games or sports. There are 2 wildlife ponds and a stream feeding into the Bog garden. There are 8 bedrooms in total, 4 ground floor and 4 on the 1st floor. Two of the bedrooms are family size, one with an upstairs room with 3 single beds and the 2nd family room has a large double and 2 single beds. All the others are large doubles and 6 have ensuite facitlies the other 2 rooms share a bath/shower room. There is also a large laundry/coats/boot room with 2 washing machines and tumble dryer and log burner. Radiators in all rooms. All linen and towels included in price as is all electricity and heating. Lots of safe parking outside on 2 driveways. Away from busy roads. Peaceful and quiet, only the birdsong will waken you. 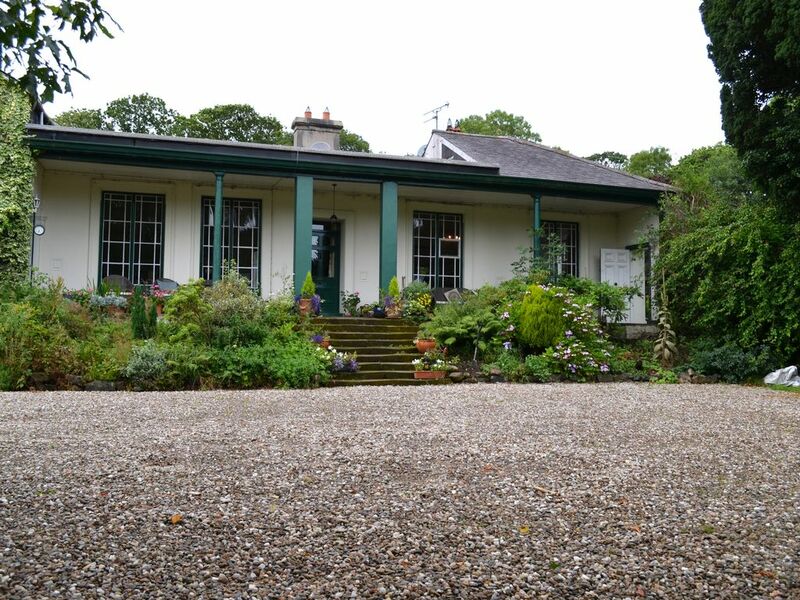 Tranquil, peaceful, pet friendly, large mature gardens and with stunning plantings and woodland. This property has been our family home for 30 years and and is a very special place. Within easy reach of the World Famous Giants Causeway, also The Bushmills Whiskey Distillery, Dunluce Castle and Carrick-a-Rede Rope bridge is 30 minutes away. 2 Washing machines available for use in Large Laundry room. Open fireplaces in 4 of the bedrooms. Open fires in the 2 Drawing rooms as well , plenty of logs in the Log Store. Plenty of safe off road parking outside the house. 5 of the bedrooms have TVS, 1 more large screen in the Lounge area. If you would like to book The Mill House @Harmony Hill for your own wedding please do get in touch with us. You can organise outside caterers for the event. There is a venue hire charge for the property varying on the dates of the wedding. This fascinating property provided excellent accommodation for our four generation family getaway - age range 8 months to 87. The house was full of character with lots to explore. The secret doors and the pool table were a particular success. We enjoyed sing songs around the piano, murder mystery treasure hunts, investigating the grounds, and eating far too much! It was lovely to have a main room large enough for fourteen of us to gather in - cosy with the wood burner going. Like a modern day Jane Austin movie! We had an excellent time! Our party consisted of 2 sets of grandparents, 2 families of 4 (children 2 and under), and 2 single adults in their 20s. We all loved it and never felt on top of one another. So much charm in this home. Our biggest regret was not staying there longer. The grounds were perfect for some family 'prom' pictures. The location was perfect for any sites you want to visit. About 30 to 60 minutes away. The washer and dryer fuse blew a couple of times but easy to fix. There were problems with the Wi-Fi never working but honestly it was great to be forced to disconnect. We spent a long weekend here to celebrate my mother's 70th birthday. There were 10 adults, 2 teenagers and 5 under 7s. The house is wonderful, it has so much communal space that you can relax by yourself in one of the many rooms despite the fact the house is full. Or all come together in one living room as their are so many seats. The kids loved all the interconnecting rooms and secret passageways and the adults loved sitting on the veranda in the sun admiring the gardens. It was honestly perfect for a big family gathering - great kitchen and all the utensils you could need. A huge dining room and plenty of glasses in the bar! I can't think of a single negative other than the snow (in april) but it gave us an opportunity to get the log fires going - every cloud!